An expert in e-learning and instructional technology, Wayne Morse was tabbed to be the interim co-director of the Emory Center for Digital Scholarship at Emory University last year to help guide the new organization through its initial development stages. In partnership with a senior faculty member, Wayne leads a team of library and IT professionals in support of digital research and pedagogy initiatives. ECDS is the combination of four existing resource areas being brought together to provide a greater breadth and depth of support for digital scholarship. 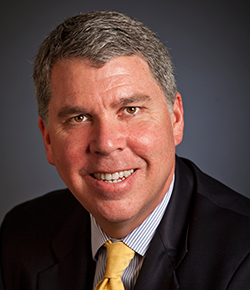 Having spent the past 16 years as director of Emory's Center for Interactive Teaching, Wayne's commitment to pedagogy includes a devotion to the never-ending process of learning. In its first full year of existence, the Emory Center for Digital Scholarship (ECDS) brought together Library and IT units that had operated independently since the 1990s into one cohesive group. Leveraging the interrelationships between this division and other entities on campus, such as project management, data storage, programming, and application development, the new model was structured to be agile. We are proud of what we have accomplished thus far. FY14 marked the release of the Battle of Atlanta app, which brought together all aspects of the center by providing a new way for the public to engage in scholarship by virtually re-living the Civil War battle. An avenue for a different type of academic engagement, the Battle of Atlanta is the culmination of over six years of work, including writing the scholarly research piece which was included on Southern Spaces. This effort exemplifies our interrelationship between the library and IT, from which we have drawn on the resources to create the app and the research that included documentation, videos, and images. The tour brought together all aspects of what ECDS does, and the output was a vehicle to engage the public. 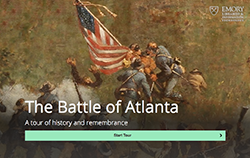 A product of the Battle of Atlanta effort, this application is a framework that is now available to anyone who wants to create their own tours. We introduced the Open Tour App during a summer seminar for representatives of historically black colleges and universities who were visiting Emory for a week-long institute. The educators used this tool to create their own digital scholarship, found it easy to use, and were empowered to create their own tours of their libraries and special collections. In the area of data management and data access, we held over 200 consultations for people needing assistance with research for data, access to data, and data management. We assisted with several classes in teaching digital story-telling and leveraging video as student assignments. Over three-dozen faculty brought ideas to the Center, and we are partnering with them on projects, new teaching initiatives, and new to ways to engage their students to do research. Next year we plan to strengthen our efforts in the area of public scholarship (engaging the public in scholarly discourse). Several planned initiatives will help achieve this goal and through outreach and engagement will bring more people into the Center. "The ECDS, more than most digital centers, works with faculty, graduate students, and library staff on projects that have open-access, public dimensions."